When Gloria Webster joined a crocheting class taught by Gail Rogers last year, she could neither crochet nor knit. 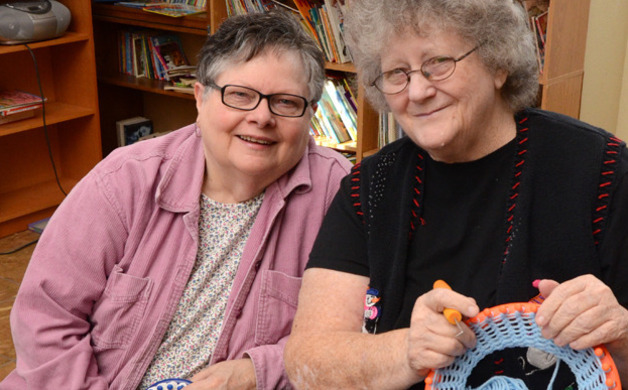 But after the class ended, the two ladies were having so much fun they found themselves crocheting for four to five hours a day—and didn’t want to stop! “There’s only so many hats you and your family can wear,” says Webster, “which is when I got the idea to donate them to newborns.” The idea was received with excitement by a team of residents at White Rock Village in El Dorado Hills, an affordable housing community operated by Mercy Housing and where Webster and Rogers are residents. Word soon spread around the community, and the two-person group grew to a team of six. To speed up the process, Rogers suggested that everyone learn how to knit the hats with some of her looms. Meanwhile Eddie Zacapa, resident services coordinator at White Rock, provided a room in which the group could meet and helped Webster reach out to Deena Purdy at Marshall Medical’s Birth Center to present their idea. The group’s first delivery of 71 caps happened in October, followed by a second delivery in December of 73 Christmas-themed caps. But the group doesn’t stop at babies. Webster alone was knitting around two or three hats a day; at that pace, they realized they had the potential to donate more hats elsewhere, which was when Rogers decided to knit for chemotherapy patients at Marshall’s Cancer Resource Center in Cameron Park. The group’s hats are now available in the wig room at the facility. “Some people don’t like to wear wigs, so now they can take a hat instead. We’re also talking about providing blankets this year, as chemo patients get really cold during treatment,” Webster says. Since September of 2014, the group has delivered a little over 200 hats to newborns and cancer patients. Recently a church in Yuba City donated three large trash cans of yarn, which the group has yet to dig into. With donations like this, supplemented by the knitters’ own purchases of yarn, they hope to add the Birth Center at Mercy Hospital Folsom to their list of recipients. And the concept is catching on. After hearing about the group, knitters in an unaffiliated housing facility in Yuba City set up their own hat-knitting team, and other residents in the El Dorado Hills area are asking to join, too. The members hope that the group continues to grow so they can continue to spread their unique, handmade hats to other centers in the region. The group meets on Fridays from 10 a.m. to noon, and Mondays from 11 a.m. to noon; anyone in the area is invited to join. They are also accepting donations of yarn. To contribute in any way and for more information, call Eddie Zacapa at 916-941-2357.